Is your Google Chrome Browser Up To Date? Is Google Chrome your browser of choice? Are you regularly diving in to websites, Google tools and Chrome extensions through the Google Chrome web browser? So just when was the last time that you checked it was up to date, meaning you were using the most recent security updates? Google Chrome is my web browser of choice. I love the way I can add on extensions that add extra functions to what I’m using and they’ll be there on any device I’m logged into. I’m also an avid user of G Suite tools and so it makes sense to me to make Google Chrome my default browser. If you close your browser completely and reopen it next time you use your device, Chrome should automatically update in the background. But if you’re like me and you often just shut the lid of your device with the browser still open, then Chrome may need to be prompted to update. So the answer to my question was slightly embarrassing – I couldn’t remember when I had last checked. I just get so busy doing other things that it is something that easily slips my mind. If you’re like me, maybe it’s time you checked to see whether you are in fact running with the most updated version yourself. Head to the 3 dots in the top right hand corner and select ‘Help’. 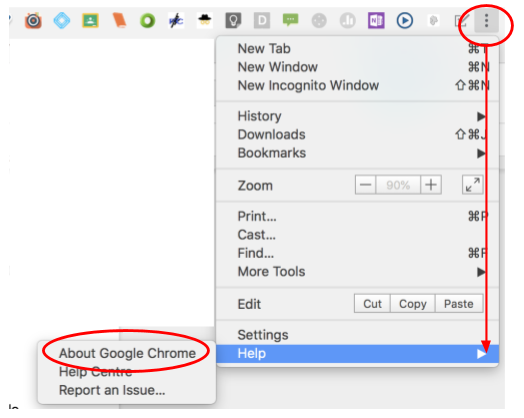 When you hover over ‘Help’ you’ll see ‘About Google Chrome’ pop up. Click on that. As it updated it told me how much progress it was making so I knew how far through the process it was. Once relaunched I could then see which version I was then running and that the process was complete. Notice the version number has changed from 66.0.3359.181 to 67.0.3396.62. Now I’m protected by Chrome’s latest security updates. Are you a Google Sheets novice? Does just the sound of the word ‘Sheets’ send shivers down your spine? That used to be me! Then I discovered ready made templates that gave me the confidence to dive into the world of cells and formulas. 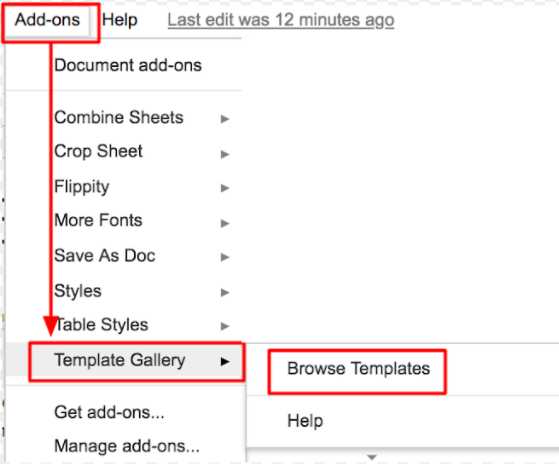 Read on to find out about four easy ways to access Google Sheets templates. 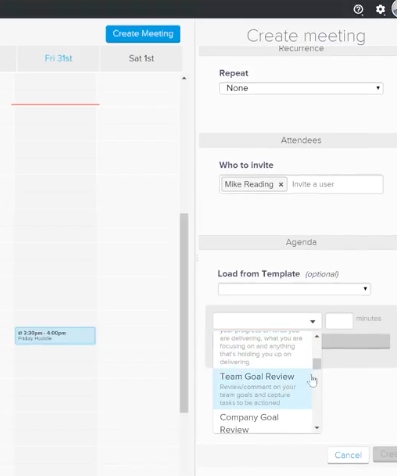 When you click on the arrow you get the option of creating a blank spreadsheet or starting from a template. Choose ‘From a Template’ and the template gallery will open. You’ll notice at the top there is a gallery with your domain name and a General gallery. This General gallery contains templates of a wide variety that have all been created by Google. There is an Education section, along with Personal, Work and Management sections. 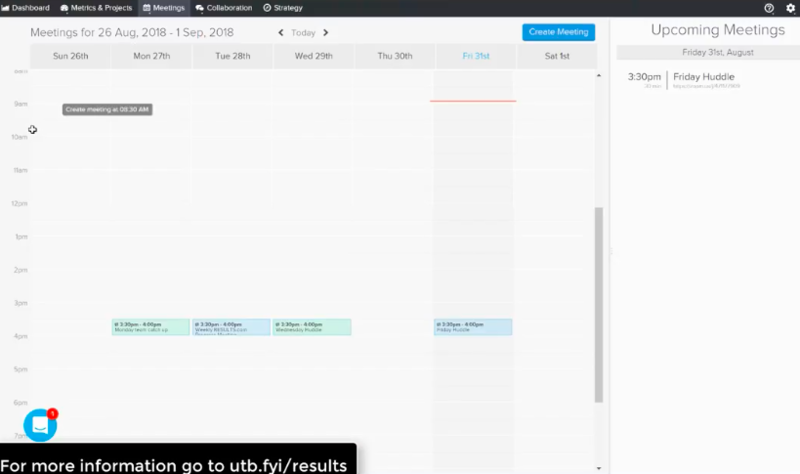 If you find a template that you want to use, you simply click on it and a new copy of it will be created in your Drive, wherever you were when you started making the new sheet. All the formatting of the sheet will automatically be there, as will any formulas that were created within the template. Once you have created your own copy, you are free to edit it however you want. 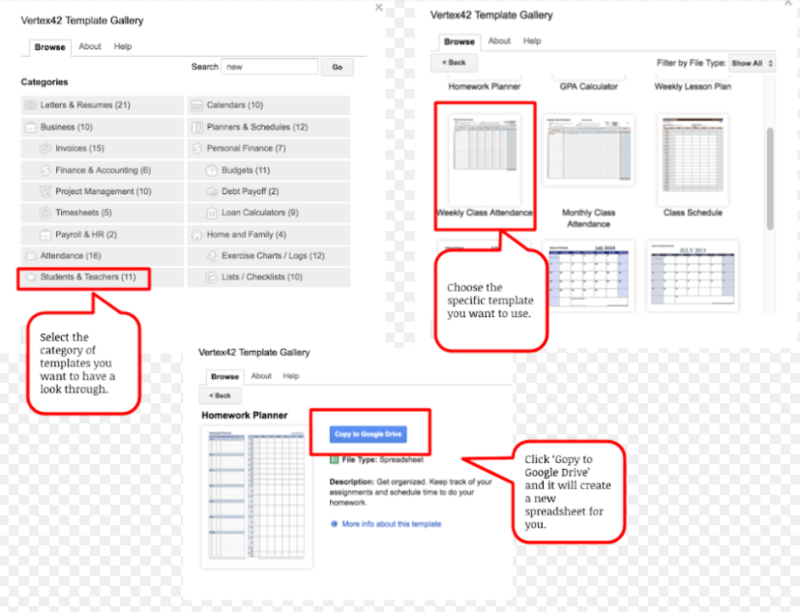 If you have a Google Sheets junkie in your school, or an expert who loves formulas, they can submit a template to your school’s gallery for anyone else to use as well. The Add-ons dialogue box will open. Type in Vertex42 and add it. Google will ask you to choose the account you want to add it to, and you will then need to allow the permissions it asks for. Once you have done that it will appear in your Add-ons menu. 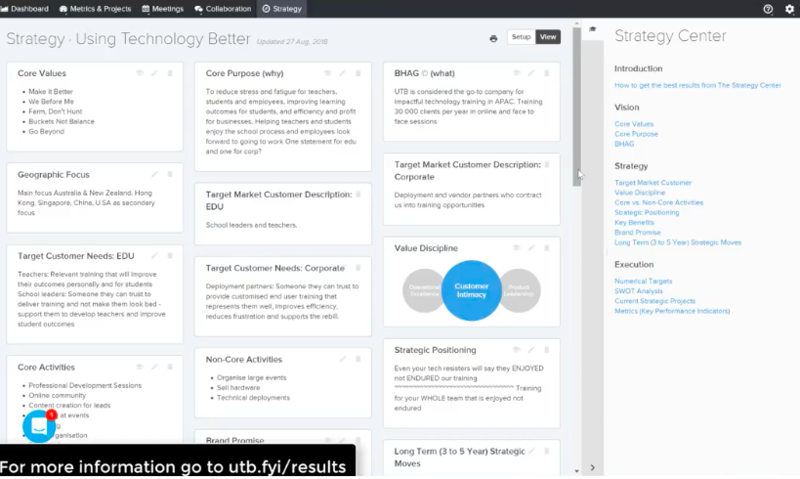 Click on the ‘Browse Templates’ to view the available templates for you to use. A dialogue box will open with all the templates menu. Again, the new sheet will be created where ever you were in your Drive at the point in time that you began the process. The sheet is completely editable, ready for you to personalise. Follow the same procedure as you did to install the Vertex42 Add-on, except this time you search for ‘Template Vault’ in the Add-on menu. Install the Add-on the same way. Again, it will ask you to choose the account you want to use and to allow it the permissions it asks for. 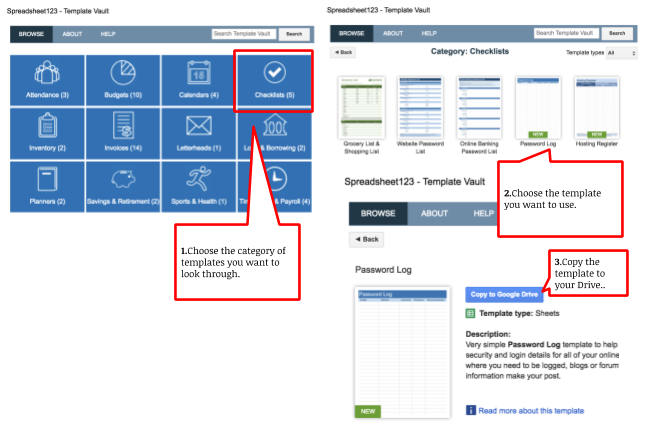 Go to your Add-ons, select ‘Template Vault’ and its menu will launch. You now have your own copy that you are able to edit however you want. 4.Convert an Excel template to a Google Sheet. Microsoft Excel has a number of templates that are pre populated in the same way that Google Sheets does. I came across this Excel timeline template that I wanted to use with my students. Within minutes I had it as a Google Sheet. 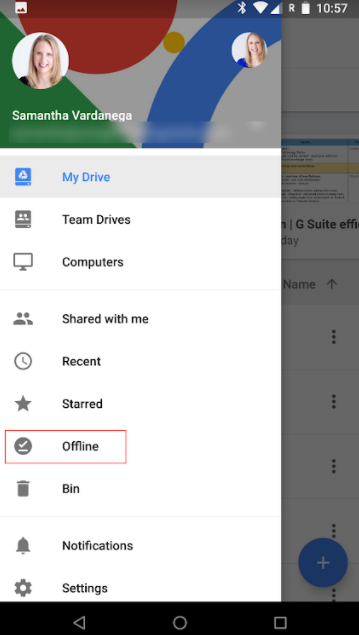 Download the Excel document to your device and then upload it where ever you want it in your Google Drive. You can do this by either using the ‘New’ then ‘Upload File’ options – or – simply dragging and dropping it into your Drive. Once you have it in your Drive, click on it, but don’t open it. Go to your three dots on the right hand side and choose ‘Open with’ and then “Google Sheets’. 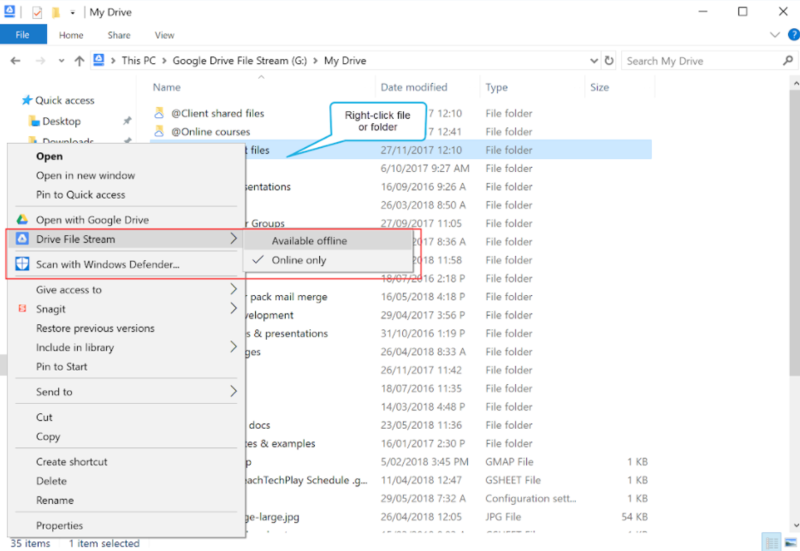 You will now have two versions in your Drive, the original Excel version and the new Sheets version. The new Google Sheets versions will usually retain all the features and formulas of the Excel version. Once I have converted mine, I then delete the Excel version as I no longer need it. So there we are. Four easy ways to get yourself started with Google Sheets. Find yourself a template and dive into the world of cells and formulas – you may just find you like it! For more tips and tricks about sheets check out Lara’s blogs here or here. In a recent blog post I discussed the woes of password management and two tools for making password management easier. However, even with a good password management solution in place, it’s still easier than you think for someone to steal your password and gain access to your online accounts. This is particularly true because many of us are guilty of reusing passwords across different websites, meaning many of our online accounts become vulnerable if just one (usually less secure) account is compromised. One thing you can do to add an extra layer of security to your Google account is to implement 2-Step Verification. 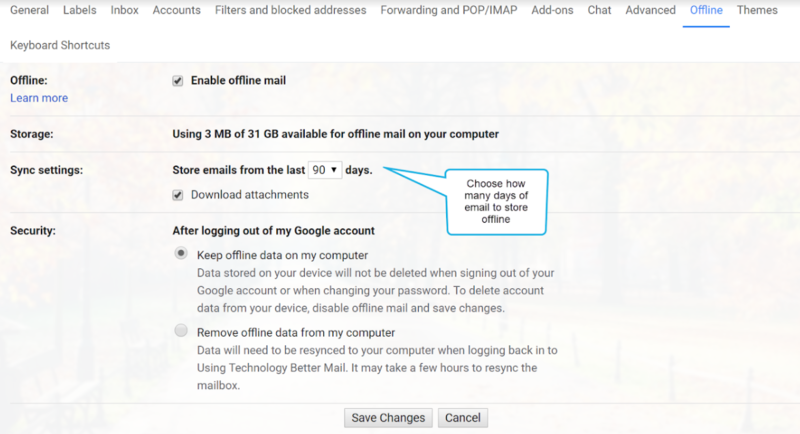 This will help prevent access to your Google account even if your password is compromised. Something you have – this is usually a one-time code or physical security key. As such, even if an attacker identities the something you know, they cannot access your account unless they also have the something you have. 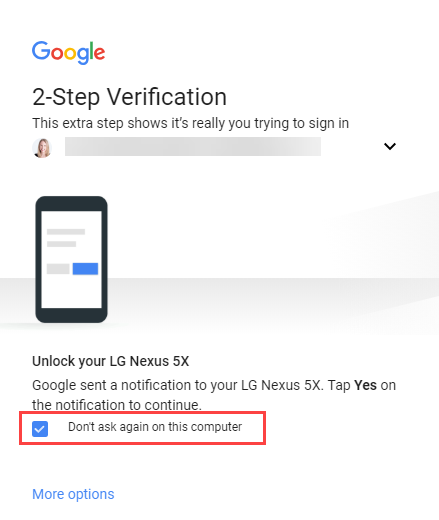 How does Google 2-Step Verification work? Whenever you sign in to your Google account, you’ll be asked to enter your password as usual. You’ll then be asked for something else, such as a code sent to your phone via text, voice call, or the mobile app. Or, if you have a physical Security Key, you can insert it into your computer’s USB port. Does that mean I have to enter the 2-Step Verification code every time I sign in? 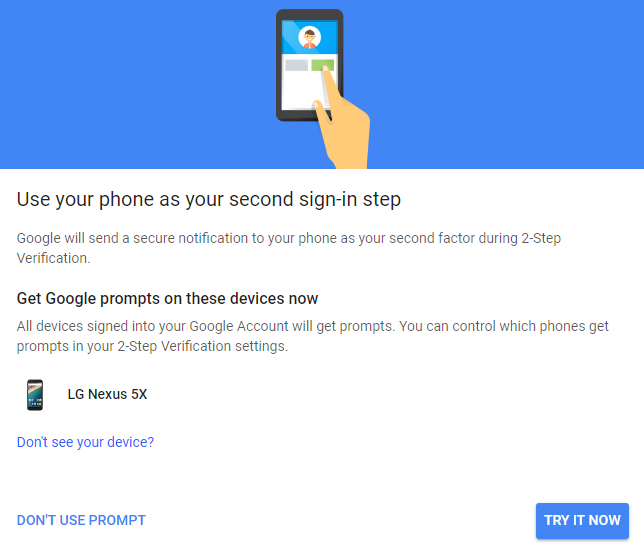 The first time you sign in to a device with 2-Step Verification, you can choose not to use it again on that specific device. That means that any future logins on that device will only require your password. However, if your account is used to login on another device, the second step of verification will be needed. This means if your password is compromised, an attacker will not be able to use it to access your account. What options do I have for receiving the 2-Step Verification code? Text message: The verification code is sent to your mobile phone via a text message. 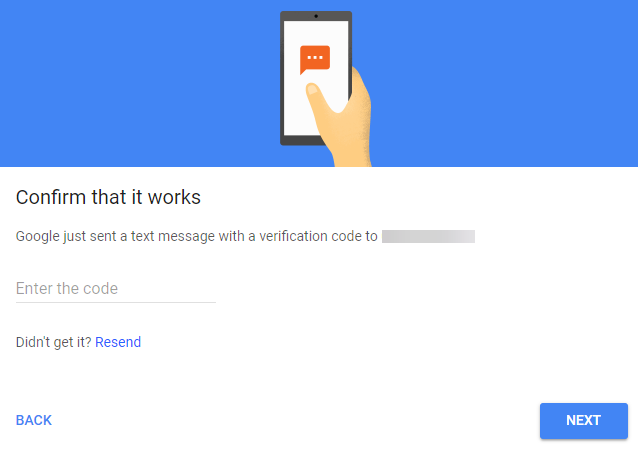 Phone call: Google calls your mobile or landline phone with a verification code. 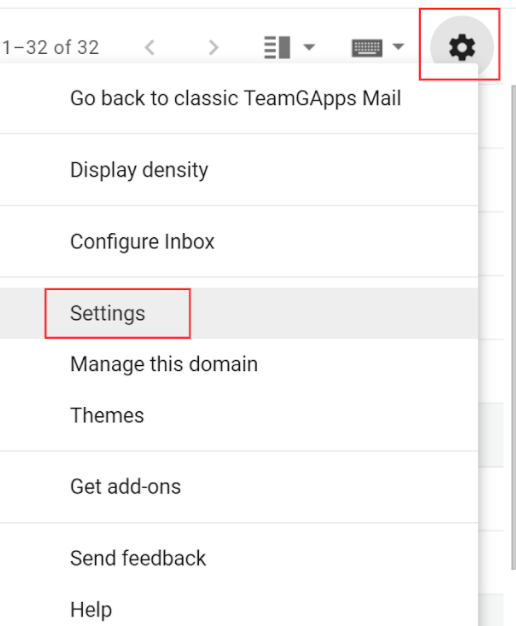 Google prompt: A prompt appears on your mobile device and you tap ‘Yes’ to sign in. Google Authenticator app: This app generates verification codes, even when your device has no phone or data service. It is available for iOS and Android. You can learn more about the app here. Another option for 2-Step Verification is to purchase a security key. This is a physical device that is inserted into your computer’s USB port. You can read more about security keys here. What happens if I lose my mobile device or don’t have it with me? 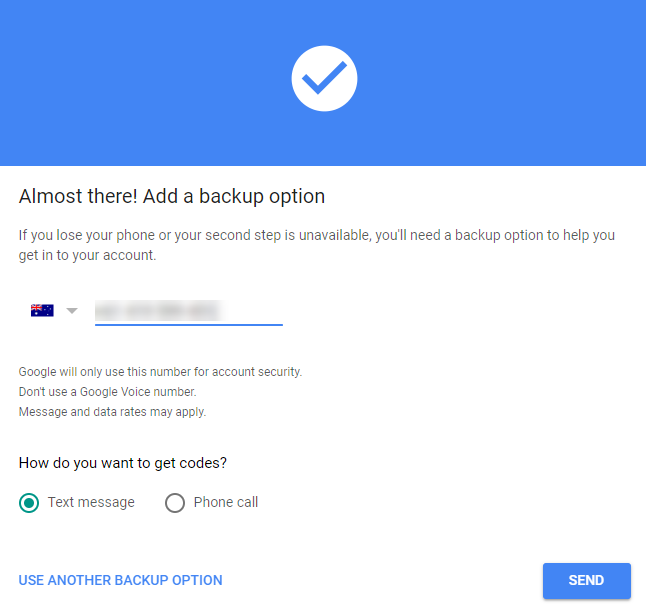 After you enable 2-Step Verification on your Google account, you can download or print a series of one-time backup codes. These can be used to access your account if you don’t have access to your mobile device or security key. You can also choose to add a backup phone to your account which can be used to receive codes if yours is not available. 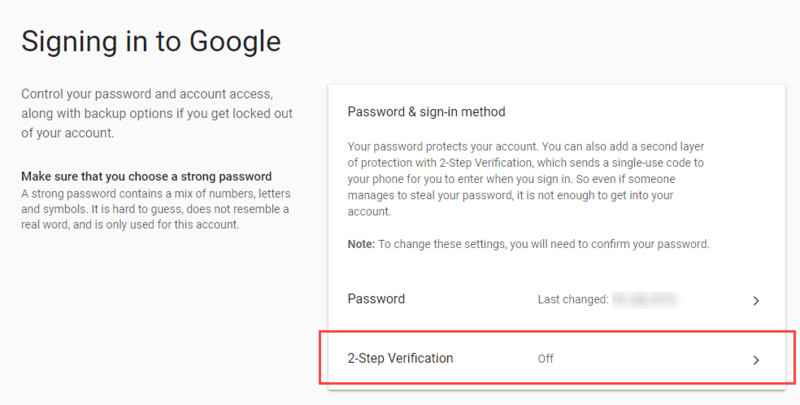 Follow the steps below to setup 2-Step Verification on your Google account. 1. Visit https://myaccount.google.com and login with the account you want to enable the 2-Step Verification on. 3. Click the 2-Step Verification section. 4. Click Get Started and then enter your password when prompted. 5. You will be asked if you want to use a prompt as your second factor for verification. This is a message that will pop-up on your mobile device asking you to tap ‘Yes’. – If you want to use this method, check the device listed is yours, then click Try it now. – If you would prefer to use another method, click Don’t use prompt. Tip: You can easily change your second verification method later too. 6. If you choose Try it now, a prompt will appear on your mobile device. Tap Yes to confirm the sign-in. Note: If you did not choose this option, skip ahead to step 7. 7. You will then be asked to choose another verification method, such as a phone number to receive a text message to. Check the number and click Send to send the code. 8. Enter the code sent to your device, then click Next. 9. Confirm that you want to enable 2-Step Verification by clicking Turn on. 10. You will then be taken to the 2-Step Verification Configuration screen. 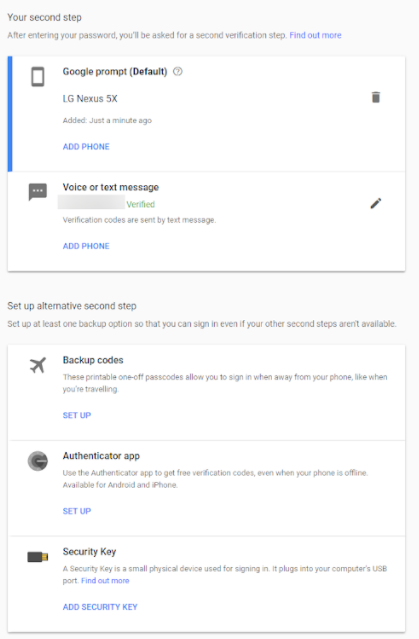 From here, you can change what you use as your second verification step (including downloading or printing your backup codes) and see the devices that do not need a second step to sign in on. 11. The first time you sign into a device using 2-Step Verification, you can choose the option Don’t ask again on this computer if you only want to use your password on that device for future logins. 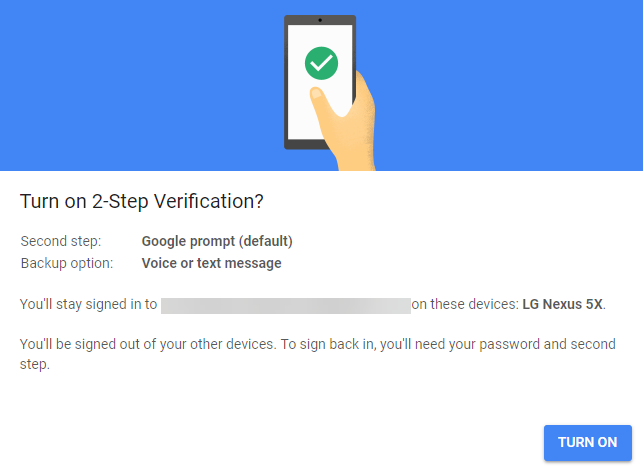 If you’re not sure about using 2-Step Verification, sit back and think about all the information you store in your Google account. Would you really want that falling in to the wrong hands? Would you really want someone accessing your account and using it for malicious purposes against your friends and family? If you’ve answered ‘No’ to either of these questions, take a few minutes now to setup 2-Step Verification on all your Google accounts! 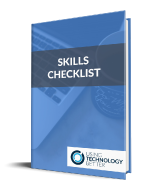 If you found this post helpful, you’ll love our online professional learning community, where you get access to Using Technology Better’s training content and expert trainers. If you’re interested in trying out the Google Authenticator app, check out this video on how to set it up. Hi there I’m Samantha from Using Technology Better. In this short video I’m going to talk about all the different types of content we can embed in a Google Doc. 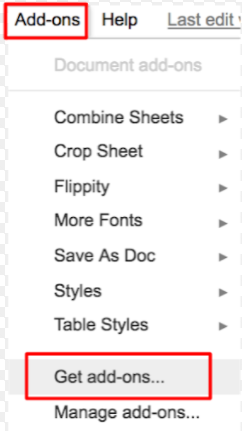 So you’ll see on my screen, I’ve got listed here Google Drawings, Google Slides, and Google Sheets and we can embed these three types of things easily in a Google Doc. So let’s start with Drawing, and this one’s been around for the longest amount of time. To pop a drawing in a Google Doc you actually do it from within the doc itself. So we come up to the Insert menu at the top here and then go down to Drawing. And as you can see that’s opened Drawings in a canvas. 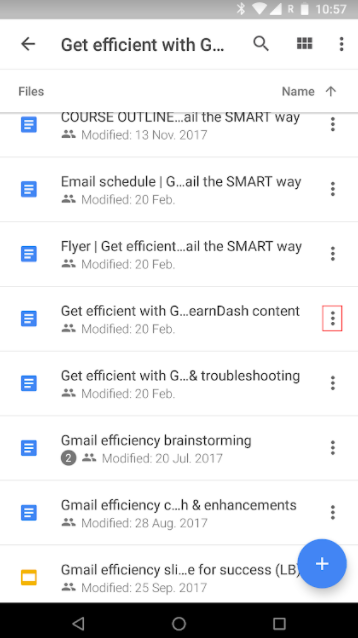 So this is like the canvas we would get if we opened Google Drawings from Google Drive, but it’s embedded in the Google Doc. So in here I can pop in text boxes, shapes, etc. So let’s say I’m looking for a text box here. I might want a background on it, and I might want to put a border so we’ll just quickly decorate it up a little bit and we can put text in here. So let’s say a good example, I’m looking for a button that might say ‘click here’ or something like that. So I will make my font a little bit better and click here. Now I couldn’t normally do a text box in Google Docs. So just by doing it in here I’ve sort of made that illusion here of a button. So I could do other things. I could do other shapes. I could do other annotations and stuff as well but for now we’ll just click Save and close and you’ll see it’s popped my button in the Google Doc. So if I click on it, it looks just like an image. So I can resize it and stuff if I want to. If I want to edit it I can just click on Edit and it’s going to take me back into the Google Drawings menu where I can make my changes and if I click save it’s going to update here. Now what I quite like about this is that I can now use this image as I said and link it to somewhere. So let’s say I want them to click here to access a Google Form I could then come up to my menu on the toolbar up here with the little link button, click on that and simply copy in a link of something I want to send the person looking at the document to, whether it be a form or a website or something like that. It’s a really good way to put some buttons in your Doc. Now the other way you might want to use Google Drawings in a Google Doc is to annotate. So let’s imagine I’ve got an image and I want to circle a section or put some arrows on it or something, particularly if I’m giving some instructions. I can’t do those annotations within the doc itself. I do need to do it in a Google Drawing. So once again I can come in and insert and drawing and I’m going to actually add an image to the drawing first. So up here we’ve got the little image button. I’m going to jump in and I’m just going to upload one from my computer. I’ve taken a screenshot earlier. Pop that in, okay here it comes, so you can see this is just a screenshot of the document I was actually using about how to access Google Drawings. In this case, I want to pop a big red box around it so I’m going to draw my box here where I want them to click on insert, change to transparent. I might it a nice big red border. So there’s one. I’m going to copy that and move it down here. You know I could have done this with arrows and stuff as well but I’ve chosen boxes, click Save and close and my annotated image is just about to pop up here in my Google Doc, done. And just like with the button before that we did we can resize and stuff as well. So that’s Google Drawings within a Google Doc. Now sometimes I get asked, what about if I already have a Google Drawing? So for instance I’ve got one here that’s just got a map of Australia with some famous landmarks. What about if I want to put that in my Google Doc? Now first thing is we can’t just go and insert drawing and pick an existing drawing. So we’ve got two options. We could come to here where we’ve got the Google Drawing and we could actually go File and go Download as and actually export it as an image and then just put the image in your Google Doc. But of course, if you want to do the editing of it in the Google Doc like we were just doing this won’t work. So as an alternative what you could just do is actually select all the content in this drawing that you’ve already got, copy it, however you would do it. I’m on a Windows machine so I’ve just done Ctrl-C, head back over to your Google Doc. I could then come in and insert another Google Drawing and I could just paste all of that stuff in here and save it. So that’s probably the quickest way if you just want to get an existing drawing into a Google Drawing within a Google Doc. So you can see there I’ve got all of my drawings. So let’s move on now and have a look at Google Slides and embedding Google Slides into Google Docs. 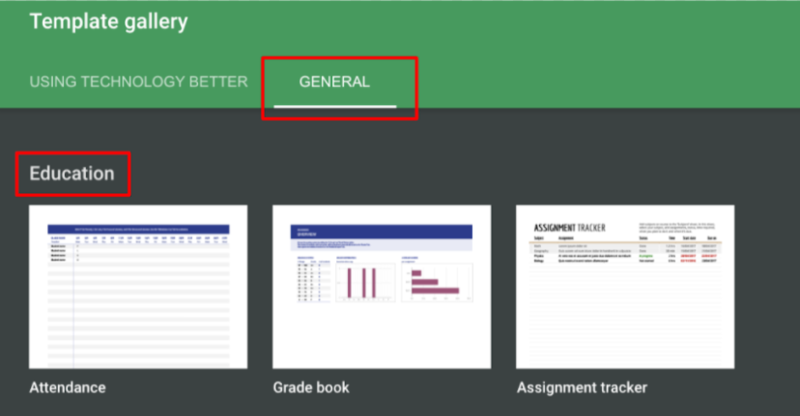 So this is the newest feature that’s been released and I was really, really excited when it came out because I think Google Slides are really powerful. So if we jump back to Slides, which I’ve got up here, you will see that I have a slide that I’ve designed and this one’s actually got a diagram in it. So if you’ve not used diagrams before on Google Slides you can go up to Insert and down to Diagram and there’s a whole lot of different ones to pick from. So if you want a diagram in your Google Doc the best way to do it is actually do it in a Google Slide and then embed that Google Slide in the Google Doc. So we’ve got our one here. So doing the embed is as simple as clicking on the slide here on the left, copying it. So again you could right click and copy or you could just use your Ctrl-C or Cmd-C if you’re on a Mac, jump back over to the Google Doc and just paste it in. Now when you do the paste it’s actually going to bring up a couple of options. It says, do you want to link it back to the presentation or do you want to paste it unlinked? Now if you paste it unlinked it’s just a completely sort of dead slide. It’s there but it’s got no recognition of where it’s come from. So if you just want to have a once off diagram in there, that’s fine. 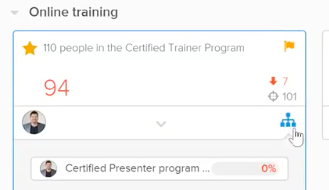 With the link to presentation, what that does is maintain that link back to the Google Slide. So if I was to come in and update the Google Slide here it would actually prompt me to update it here in the document as well. 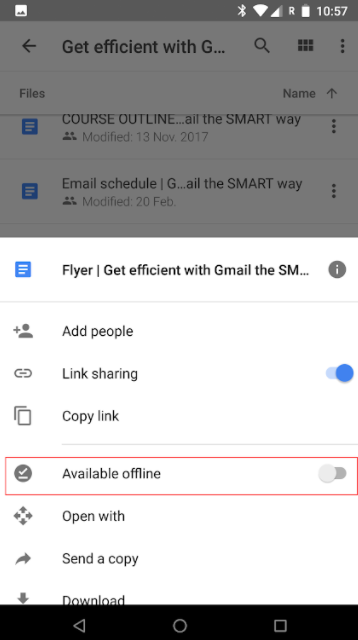 So if you’re likely to be doing changes in the Google Slide or you want to be allowed to edit it after you’ve popped it in I would suggest linking it. So let’s paste it and you’ll see there’s my diagram, fantastic. So I can click on it now. Again, it’s kind of putting as an image so I’ve got my normal image wrapping options down here and if I want to actually go back to the content I can click on the link slide options and I can say open source and it’s going to open back that one here that we had in the Google Slide and if I make a change, so why don’t we make that bright red and why don’t we make that one orange. They’re easy changes. If we now go back to the Google Doc just a moment should bring us an option to update, and if it doesn’t come up quick enough we can just click on that little drop down and we can actually say Update and it’s going to do the update. All right, so you’ve got these two options. If it doesn’t prompt you automatically you can manually force it. So that’s Google Slides. So any time you want to do any kind of creative work I suggest doing it in Slides and then embedding it in the Google Doc, as I said great for diagrams. We could have also done the annotation kind of stuff or this kind of stuff we did in Drawings in Google Slides as well. 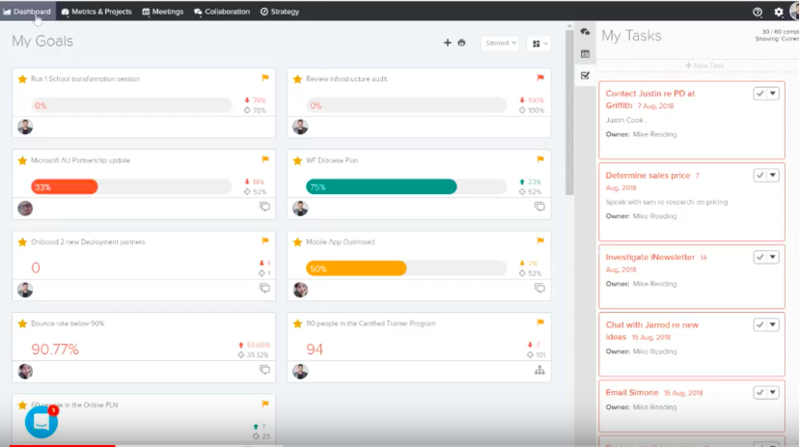 So you have to think about what tools going to work best for you. And the last one is Google Sheets. So I’ve got a Google shape opened up here where I’ve got some basic data and a graph. So what I can do is put either of these into the Google Doc and again we can link it back to the Sheet. So I’ll start with the chart. If I click on that and just copy it, jump back to the Google Doc and click paste just like we have before I’ve got an option to link it. So I can either leave it linked to the spreadsheet, so again if we update the spreadsheet it will update it in the doc or I can paste it unlinked. Like I said before then it’s just sort of that dead data that doesn’t have any link to anywhere. So let’s link it. So we’ll paste it. You can see it there. Now again if I go back and change the chart, so let’s make something quite excessive so we can see it. We’ll make that to fifty. You can see it’s changed quite a lot. We’ll jump back in Google Docs. See we’ve got that update pop up straight away. You can click on that and it will update here. Now we can also do that in Google Slides as well just so you know you can copy a chart into a Google Slide and have the same effect. So we’re not focusing on slides today but that’s the other choice you’ve got. Now the very last thing, if I go back to that spreadsheet, I can also copy the actual table of data. I can copy that and paste that in the Google Doc. Again, I get those linking options so let’s link it and we’ve got the table. So you’ve got the choice of what you want to pop in there. So there we go. 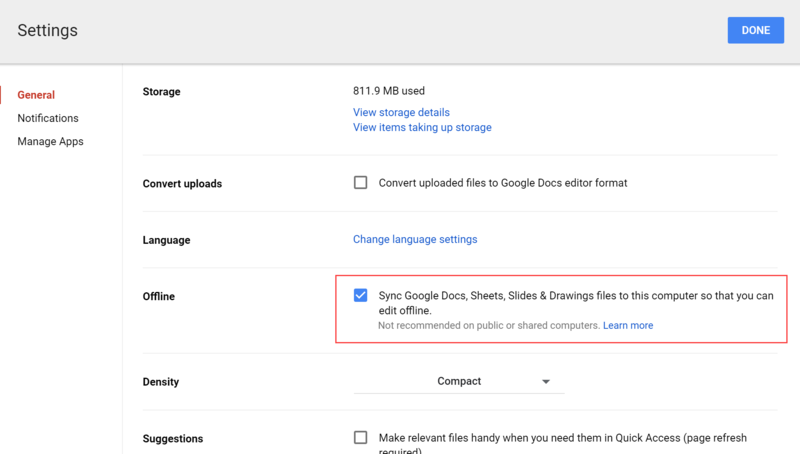 There’s a few ways that you can embed content from Google Drawings, Google Slides, and Google Sheets into Google Docs. Want to get quick and easy access to all our new videos? Download the Using Technology Better app for iOS or Android. Recently we wrote about five sites where you can find free images and showed you five ways to become a smarter image searcher. 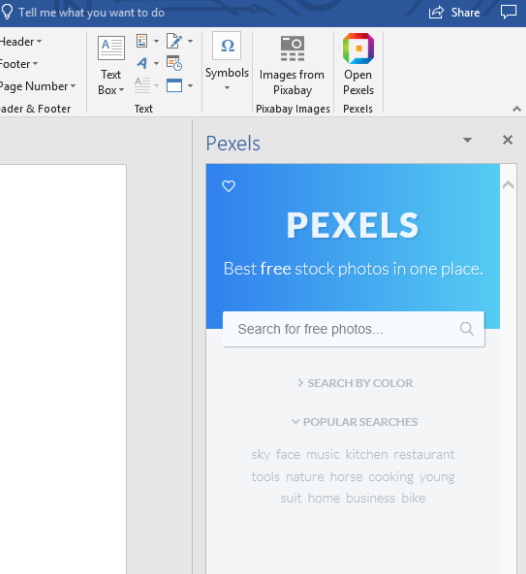 In this post, we’ve got some great tips for finding thousands of free images without having to leave Microsoft Word or PowerPoint. All of these images are covered by Creative Commons licensing, meaning you can legally use them in your work (although it is always a good idea to cite your sources!). Note: The tools and instructions in this article are based on Microsoft Word and PowerPoint 2016 (with the latest updates installed via an Office 365 subscription). 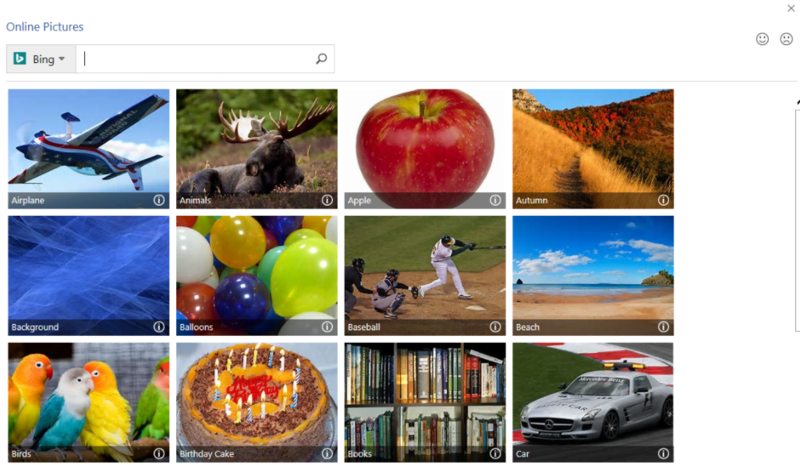 The Online Pictures search tool is built-in to both Microsoft Word and PowerPoint (and OneNote too!). 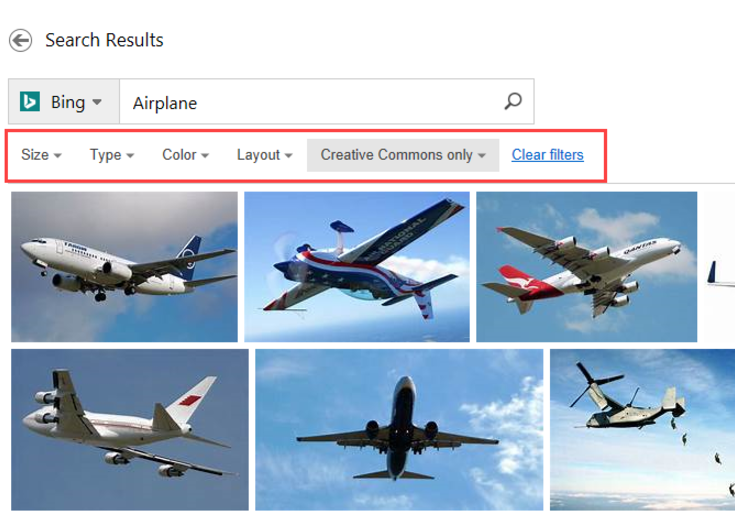 It uses Bing Image Search (similar to Google Image Search), which offers a huge range of creative commons images. You can filter images by a range of criteria, and the Creative Commons attribution will be added automatically when you insert the image. 1. Select the Insert tab > Online Pictures. 2. Choose a category, or type a search term. 3. 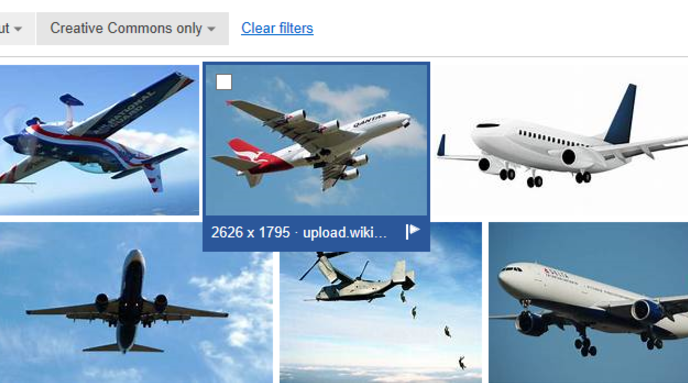 Use the drop-down filters at the top of the image search results to refine your search. Tip: You’ll notice that the ‘Creative Commons’ only option is on by default. 4. Double click an image to insert it into your document. You can also insert multiple images at once by ticking the boxes in the top left corner, then clicking the Insert button (bottom right corner). The image will be inserted into your document or presentation. 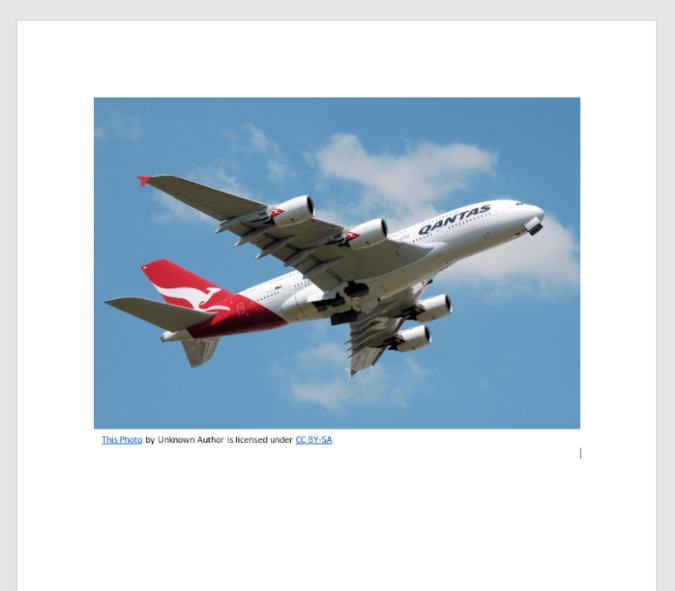 Notice how a link to the image source and the licensing terms is automatically included below the image. 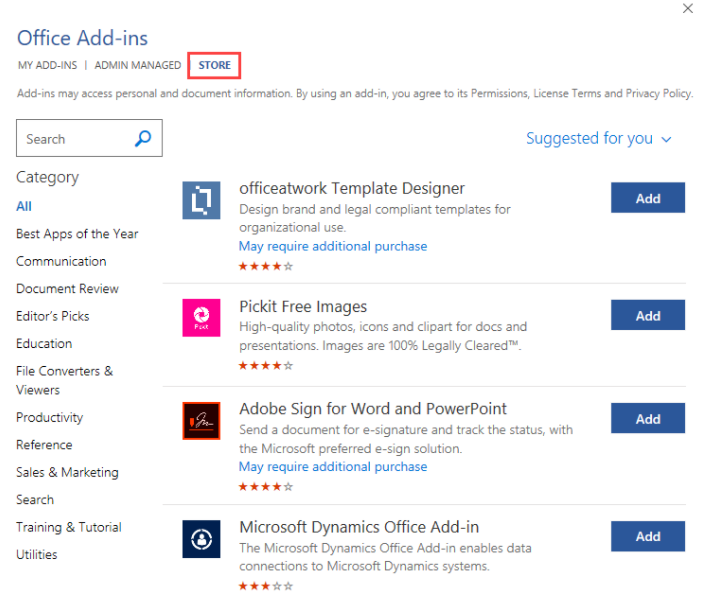 Office add-ins allow you to add heaps of extra features and tools to Microsoft Office applications. There are several add-ins that allow you to search for images from popular free image sites, including Pixabay, Pexels and Pickit Images. 1. Select the Insert tab > My Add-ins. 2. Click the Store section. 3. Browse or search for the Pixabay add-in. Click the Add button to install it. 4. The add-in will be installed, and a button will be placed on the Insert tab. Note: The location of the button varies depending on the add-in. The Pixabay button is located on the Insert tab. However, other add-ins may put their buttons on other tabs. 5. To use the add-in, click the button and Pixabay will load on the right-hand side of the screen. 6. 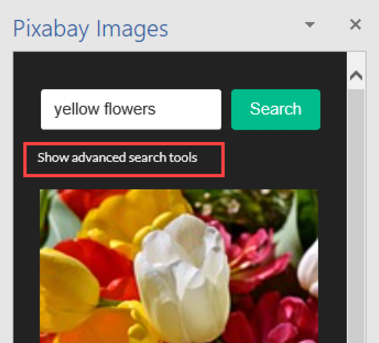 Pixabay also has advanced search features to help you refine your search results. To access these, click Show advanced search tools. 7. Use the drop-down boxes to select your search criteria. images on Pixabay are covered by Creative Commons CC0 licence, which means you can use them for any purpose without attributing the original author or source. 8. Double-click an image to insert it into your document or presentation. 1. Install the Pexels add-in using the same process outlined above for the Pixabay add-in (but be sure to search for Pexels instead!). 2. The button for the Pexels add-in will be placed on the Insert tab. 3. To use the add-in, click the button and Pexels will load on the right-hand side of the screen. 4. Type in a search term to begin searching. You can also use the Search by colour option to refine your search. 5. Double-click an image to insert it into your document or presentation. 1. 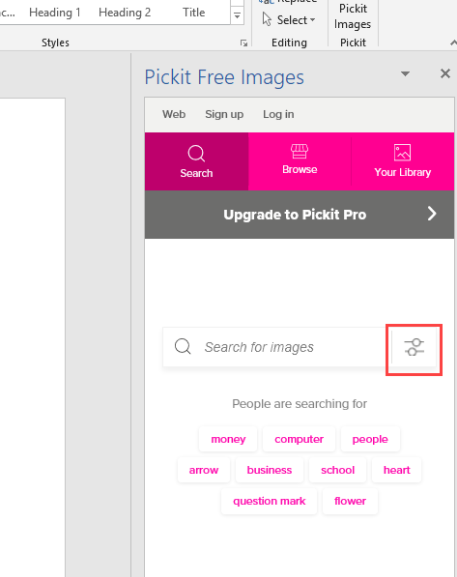 Install the Pickit Images add-in using the same process outlined above for the Pixabay and Pexels add-ins (but be sure to search for Pickit Images instead!). 2. The button for the Pickit Images add-in will be placed on the Home tab. 3. To use the add-in, click the button and Pickit Images will load on the right-hand side of the screen. 4. Type in a search term to begin searching. You can also use the filter button on the right side of the search box option to refine your search. 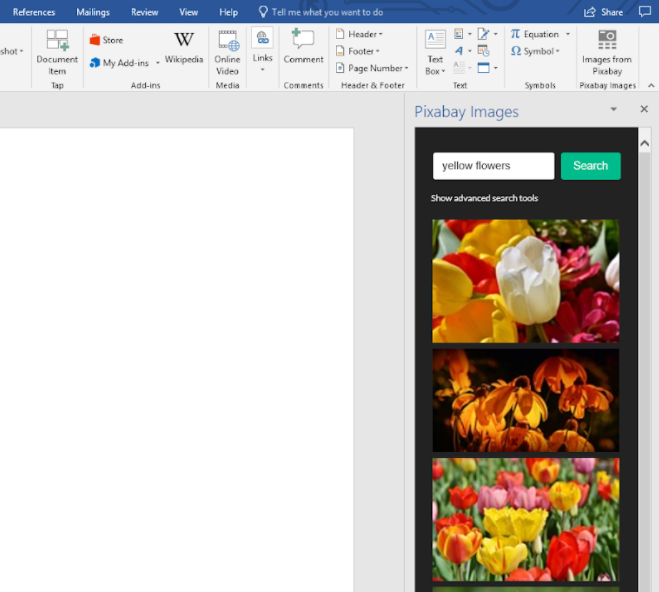 Once you have installed an add-in in one Office application (such as Word), you just need to add it to other applications you want to use it in (such as PowerPoint). 2. In the My Add-ins section, you will see a list of add-ins that you have installed in other applications. 3. 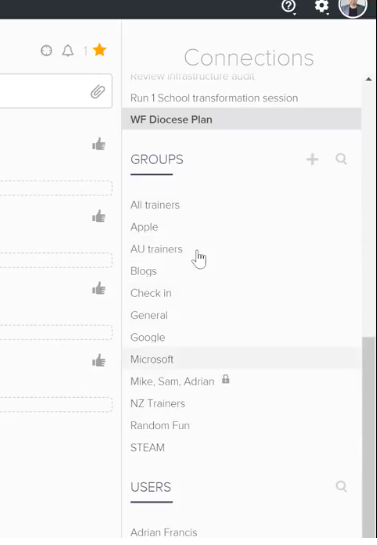 Click on the add-in you want to add, then click the Add button at the bottom of the Office Add-ins box. 4. The add-in will be added to the toolbar. 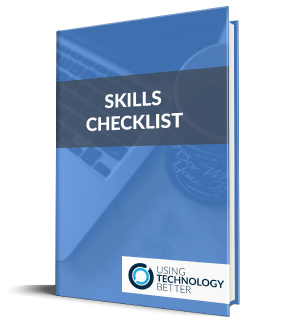 Want to learn even more Office 365 tips and tricks? 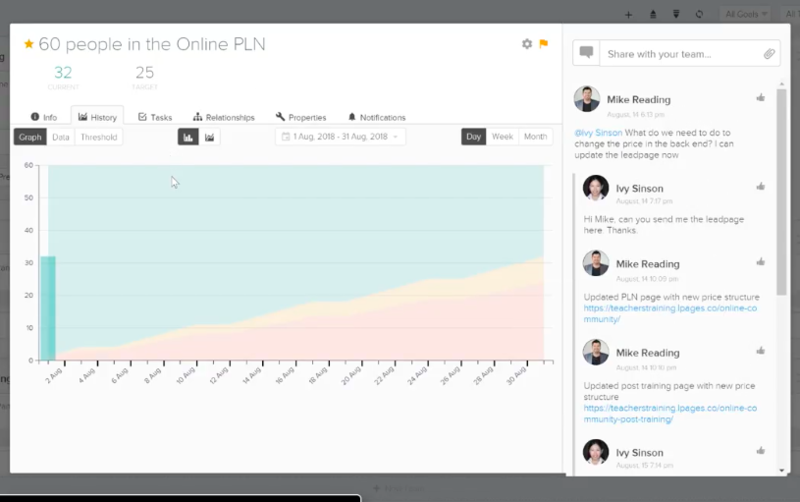 Join our online professional learning community.